One group thinks the fix to the city's ailing subways is, once again, congestion pricing. Andrew Siff reports. Congestion pricing and the reorganization of the MTA were among the proposals made by a task force formed to help solve the transit crisis and traffic gridlock that have become commonplace for New Yorkers. The Metropolitan Transportation Sustainability Advisory Workgroup — a panel established through legislation and meant to be a roadmap for the MTA Board, lawmakers and stakeholders — released its report Tuesday. According to the workgroup, the transit crisis the city faces is “a manifestation of the failure to keep pace with the rapid growth of the city and region over the past two decades,” and because of this, it has proposed suggestions to possibly alleviate the transit headaches experienced by New Yorkers and spearhead collaborative deliberations over transportation system funding, reorganization and reform in the upcoming year. The report suggests the monies gathered by establishing a congestion pricing zone in the region’s commercial center should exclusively go to the MTA capital program and associated operating expenses. The theory behind congestion pricing is that, as cities grow and expand, streets become increasingly scarce and should be priced accordingly. 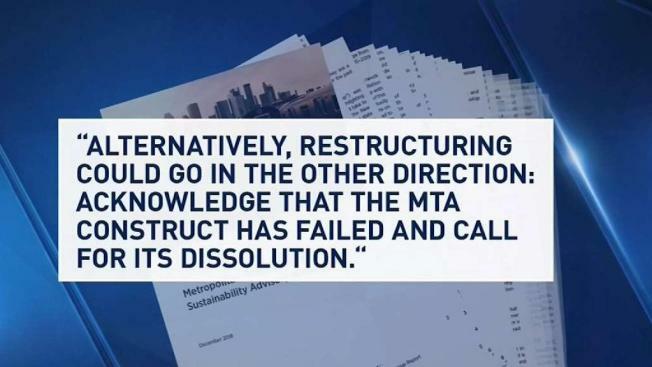 Furthermore, the study says that since there is public mistrust and concern that “funds sent to the MTA will disappear down a black hole” the agency must generate the necessary support for congestion pricing and any new funding sources by regaining the public’s trust in the MTA and operating agencies. The panel believes an independent entity will resolve the issue. “This will take independent verification of cost projections and better oversight of execution on the MTA’s capital program,” the report says. The panel has called the coordination between the MTA and local governments on capital planning and construction “an ongoing challenge ever since the MTA’s creation,” with the need for coordination intensifying as the MTA seeks innovative project financing. Additionally, the report also recommends reducing fare evasion, end placard abuse to reduce congestion, relieve congestion caused by tour and sightseeing bus activity, provide the city greater flexibility to enforce traffic laws, allow the MTA to migrate to a 10-year capital planning process, recognize commuter rail interstate challenge, reduce subway delays and improve station conditions, among other suggestions all aimed at improving the transit crisis.